Click here to print a coupon for 20% off your entire purchase at Bath & Body Works, good through tomorrow. Don’t forget that this is tomorrow! First 20 shoppers get a free mist with purchase, plus other gifts! 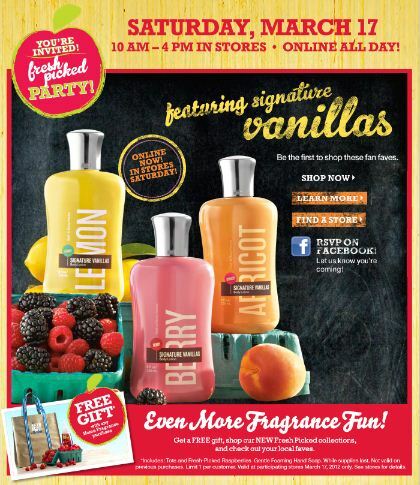 THIS Saturday, stop in at Bath & Body Works from 10am-4pm for their Fragrance Event! Check out their new fragrance mists, plus receive a FREE full-size shower gel and FREE mini body lotion with any full-size Signature Collection purchase. 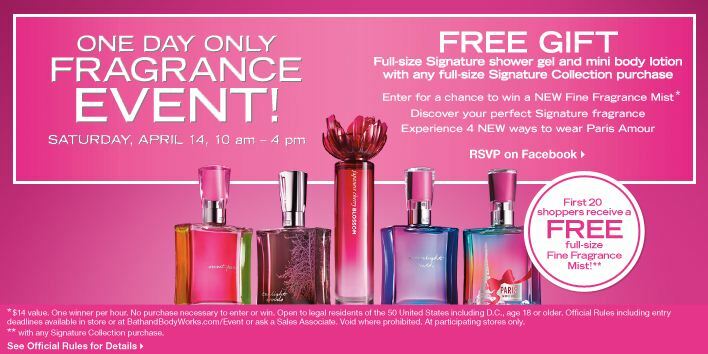 In addition, the first 20 shoppers can receive a FREE full-size fragrance mist with any Signature Collection purchase! I’m unclear as to whether that’s a separate purchase or a bonus gift. Bath & Body Works is once again running their Buy 3 Get 3 promotion! Buy any 3 body care items and get 3 FREE! This deal is available in store and online… if you choose to shop online, today you can get $1 shipping on your order of $25 or more when you use promo code FRAGRANCE25. They also still have their soaps on sale if you need to stock up, 4 for $15 or 6 for $20. FREE Gift from Bath & Body Works TODAY! Don’t forget to stop in today! 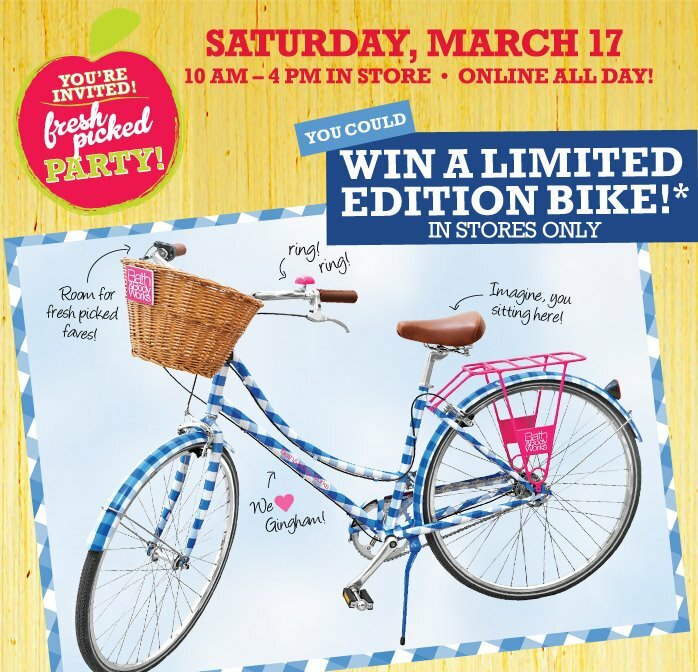 In addition to those goodies, you can enter to win this bicycle! Total value $10.50. Limit one free tote bag and Fresh Picked Raspberries Gentle Foaming Hand Soap per customer. Offer excludes home fragrance, accessories and gift sets. No substitutions. While supplies last. To redeem online, add product to your shopping bag and enter promotion code at checkout; the free gift will automatically be added to qualifying orders. This promotion code can only be redeemed for the free tote bag and free Fresh Picked Raspberries Gentle Foaming Hand Soap; it is not valid with any other offer that requires you to enter another promotional code at checkout. If another code is entered at checkout, this offer will be void. Not valid on previous purchases. Selection may vary online and by store location. See participating store(s) for details. 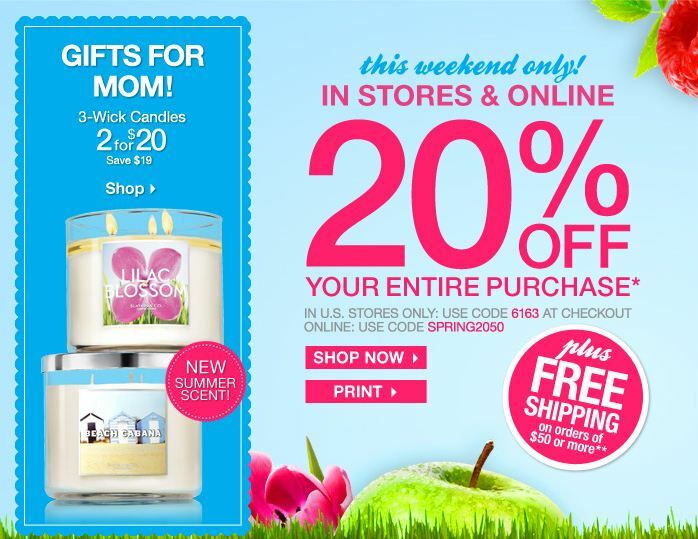 Offer valid only at U.S. Bath & Body Works stores 10 a.m. – 4 p.m. March 17, 2012 and at BathandBodyWorks.com through 11:59 p.m. EST March 17, 2012. Not valid at Bath & Body Works stores in Canada and Bath & Body Works Outlet locations. Comments Off on FREE Gift from Bath & Body Works TODAY!